In 1989, Herschel Walker was part of a campaign to try to keep America's youth off drugs. 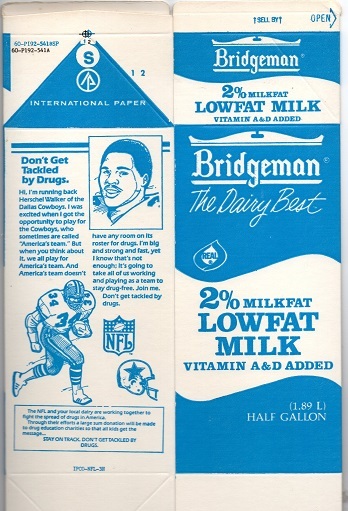 That year, two dairy companies, Bridgeman of St. Paul, Minnesota; and Clover Farms, of Reading, Pa. put a message from Herschel on side panels of their milk cartons. The message reads: "Dont Get Tackled by Drugs." "Hi, I'm running back Herschel Walker of the Dallas Cowboys. I was excited when I got the opportunity to play for the Cowboys, who are sometimes called "America's team" But when you think about it, we all play for America's team. And America's team doesn't have any room on it's roster for drugs. I'm big and strong and fast, yet I know that's not enough; it's going to take all of us working and playing as a team to stay drug-free. Join me. Don't get tackled by drugs. The Clover Farms examples are red and green, and there is also a purple side panel example. The message is the same on all variations.